I took my sewing machine and overlocker to be serviced yesterday afternoon and I must admit the sewing space looks a little bare. Never mind, my head is definitely in planning mode and the pause from sewing gives me time to share with you some of my recent unselfish sewing. Well… um… that’s not quite accurate. This process started with some selfish sewing as a girl has to test a free online tutorial before starting a present making assembly line. 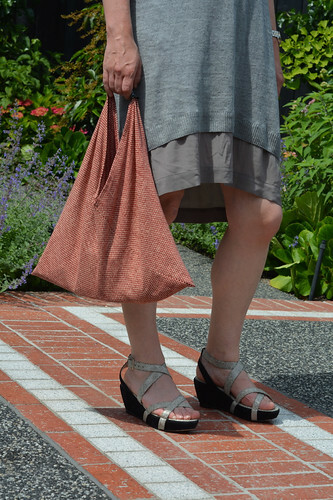 Hello Triangle Bag in lovely Japanese cotton from Tessuti! For some extra ‘WOW’ I added a small piece of leather to the handle. 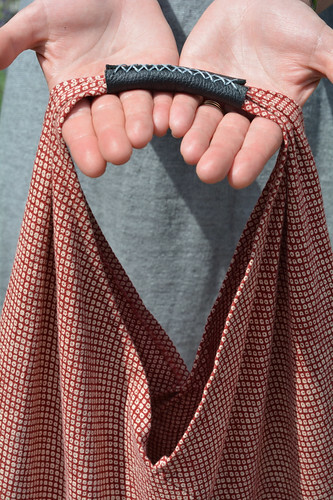 Want to make your own triangle bag? All the details can be found in a tutorial by //Between the lines//. 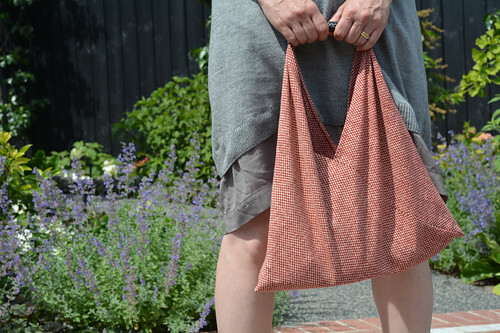 The bag is sewn from a rectangle of fabric so it’s very economical in the fabric consumption department. 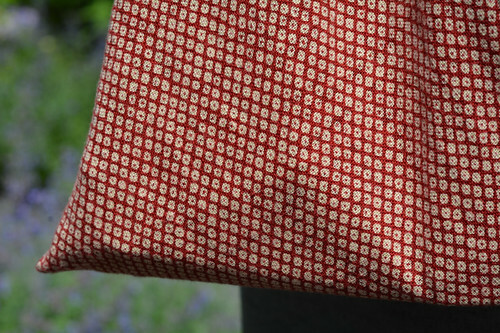 The rectangle is hemmed on all sides before you undertake some fancy folding and stitch a couple of seams. 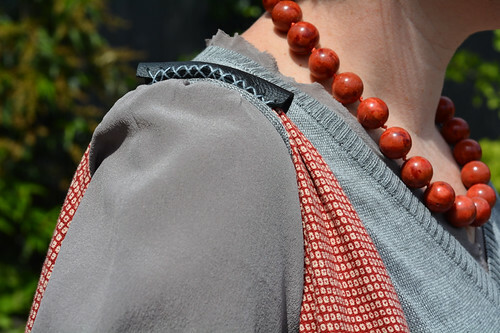 I used a double-fold hem and took great delight in learning how to sew mitred corners. Simple pleasures people. For the leather detail I cut a rectangle of leather (3.25 inches x 2 inches) and used my leather hole punch to make small holes a quarter of an inch apart on both of the long sides. The leather is joined, without snagging the fabric underneath, using pearl cotton and a cross stitch. 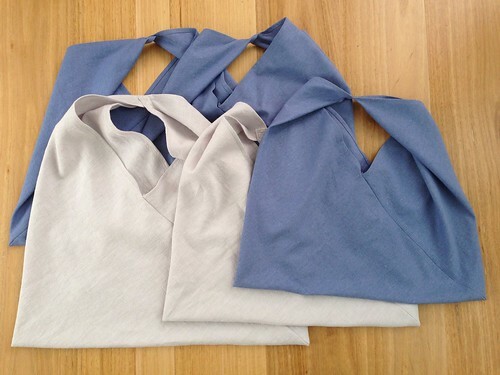 These five linen triangle bags, which will make perfect end of year teacher and Christmas gifts, are now just awaiting the leather detail on the handle. 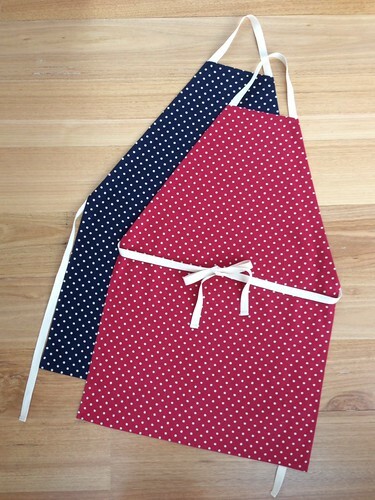 I’ve also used Purl Bee’s Unisex Adjustable Apron tutorial and some lovely spotted linen to make these beauties. Yes, his and hers matching BBQing aprons will be under our tree! I have dibs on the red… here’s hoping Mr Blogless Anna appreciates the navy! The last of my present making was not one (I couldn’t stop at one!) but two make-up purses. 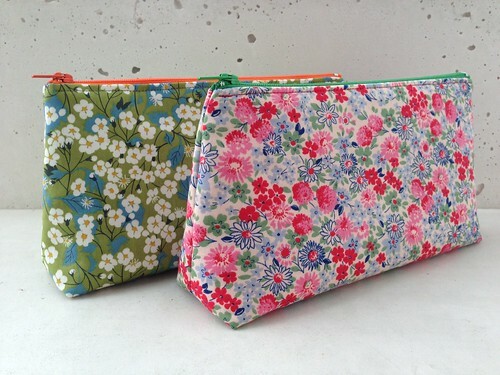 The You Sew Girl Make-up Purse comes in four sizes and this purse, the largest, uses a 8″ (20cm) zip. In case you are wondering… the purses are keeping their shape so well because I added a medium weight interfacing and fusible fleece to the main fabric. 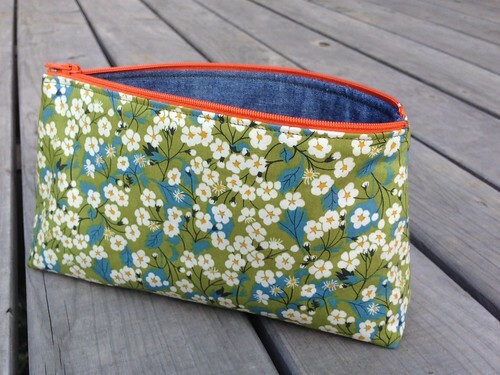 I’ve used this pattern before to make Miss A a pencil case (zippered pouches have so many uses!) and she has requested a new one for the start of the 2015 school year in her favourite liberty print. That requested has been added to the January sewing list! And the best news about all these things… I had everything, bar the twill tape for the aprons, in the stash or the fabric scraps tub! It’s times like these when a large stash comes in handy… well that’s what I’m telling myself! Shameless justification? Oh yes! I’ve got Christmas and end of year teacher gifts all stitched up. How about you? My girls finish school on Tuesday, so I needed to be organised. It’s also easy to put selfish sewing aside for a couple of weeks when I know that from next weekend it’s two and a half days of sewing at Sewjourn! Not sorted yet – but this is giving me some ideas! 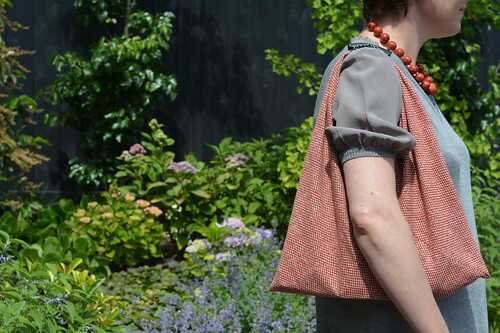 I’ve made one of those triangle bags before – it’s a clever piece! Thanks Erin. I totally agree. LOL. The shoes were purchased from Zomp (Flinders Lane, Melbourne CBD) in the sales earlier this year. Awesome! You’ve been on quite the roll. I am stealing your leather handle idea. Told hubby that would be his contribution to the gifts, haha! I love a bit of present outsourcing. Mr Sew Unravelled has totally proved himself in the leather crafting dept so he’s definitely the right person for the job! Did it all myself in the end! Great gifts. Every year I think i will make gift, but i never quite get my backside into gear. I started making teacher gifts when Miss A was in four year old kinder and somehow it’s become a tradition, and one that I actually enjoy. Teaching is one of those occupations that I take my hat off too. I must admit that I’m finding it hard to part with the liberty make-up purse… I’ve brought some more zips to make more… I think make-up purses might be a good palette cleanser between selfish sewing projects. The bags are rather magical how they come together. I didn’t think there was ever such a thing as too much chocolate… but maybe there is! These are all so good. Thanks for the links, would love to try the bags and the purses. I’ve just finished some Libby skirts that will be gifts. Well done on getting all those gifts done. Thanks for an awesome blog in 2014. I have loved reading your posts. Wishing you a merry Christmas and a relaxing new year. Sending Christmas and New Year greetings to you too Meagan. I’ve photographed six items in the last 24 hours, so there will be lots of posts to read in the coming weeks!